This one and a half story stone house was occupied by the widow Mary Thompson during July of 1863. Of approximately 30 scenes photographed by Civil War photographer Mathew Brady a week and a half after the battle, four were taken in front of this dwelling. The Library of Congress provides high-resolution copies of this photograph, including the left side of the stereograph. As always, you can click on our image above to enlarge it. This view was taken facing northwest in July, 1863. Anna Marie “Mary” Long, was born on November 12, 1793, near Littlestown, Pennsylvania. Her first husband was named Daniel Sell, with whom she had three daughters. Daniel Sell died at the age of 30 in 1822. Four years later the widow Mary Sell had been remarried to one Joshua Thompson, with whom she would have two sons and three daughters. Joshua Thompson, possibly out of work by the 1830s, became a drunkard and left Mary and his family to fend for themselves. By the good fortune of a few friends, including Thaddeus Stevens, Mary was able to move into the stone house on Seminary Ridge in Gettysburg, which Stevens had bought at auction for a mere $16. 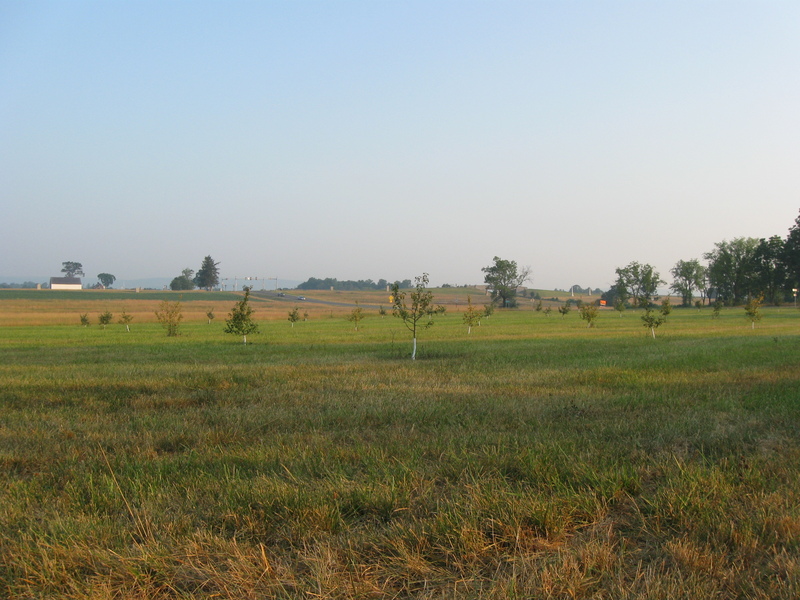 The subject of the first part of our post today is to show you the orchard across the pike from the house that has been replanted in this area, and to examine where Lee’s Headquarters were during the Battle of Gettysburg. 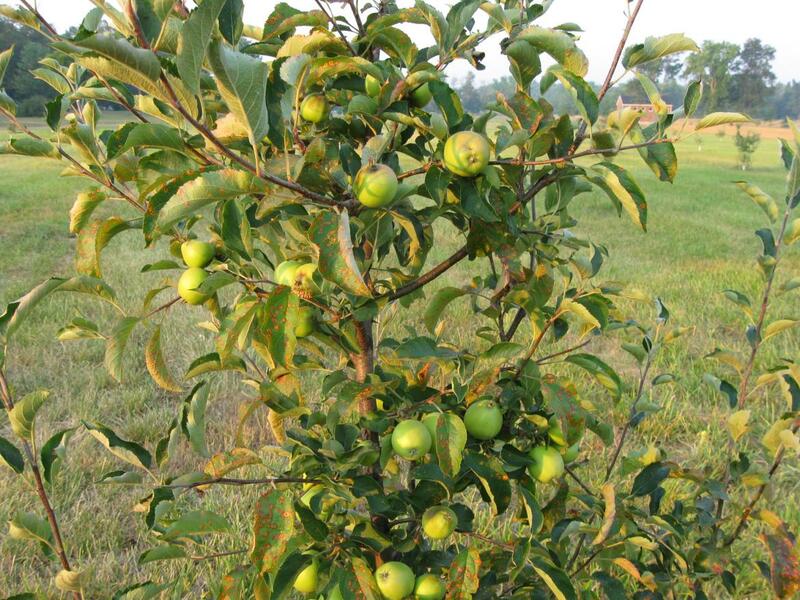 It is believed that the apple orchard located here in July of 1863 was owned by a farmer named Samuel Hartzell. In the left background of this shot is the McPherson barn on McPherson’s Ridge. 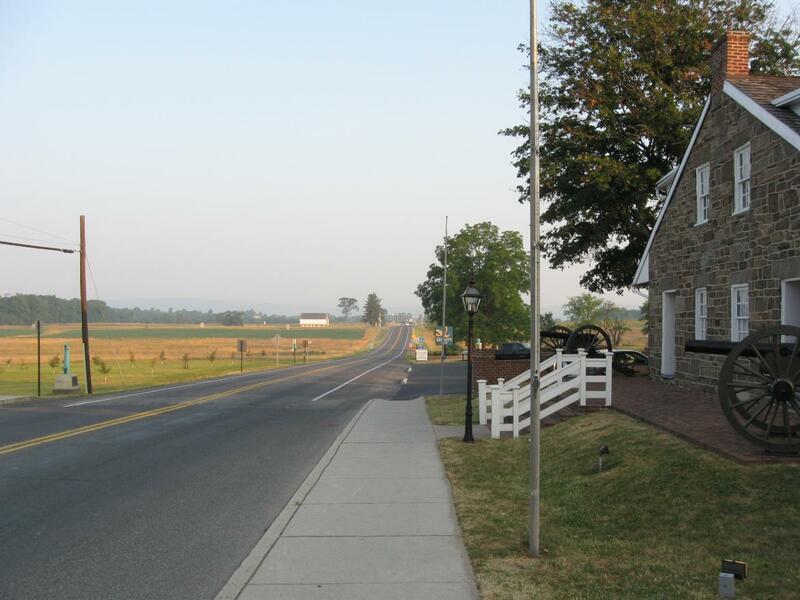 The Quality Inn and Thompson house are out of this view to the right, across the Chambersburg Pike. This view was taken facing northwest at approximately 6:40 AM on Tuesday, July 6, 2010. 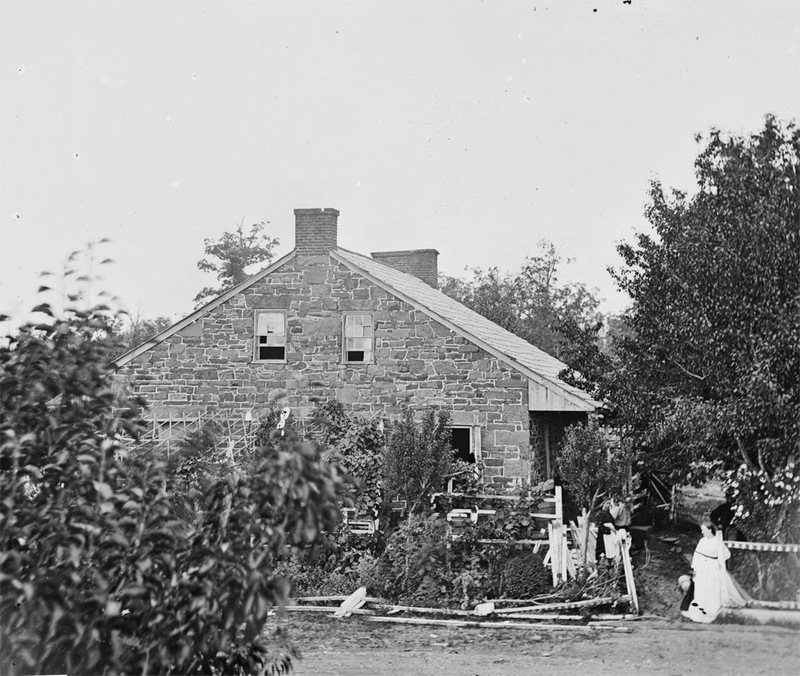 The Thompson house, located behind the tree in the left background, was built in either 1833 or 1834. The famous “Widow Thompson” moved into the property with her eight children in 1846. This view was taken facing southeast at approximately 6:40 AM on Tuesday, July 6, 2010. 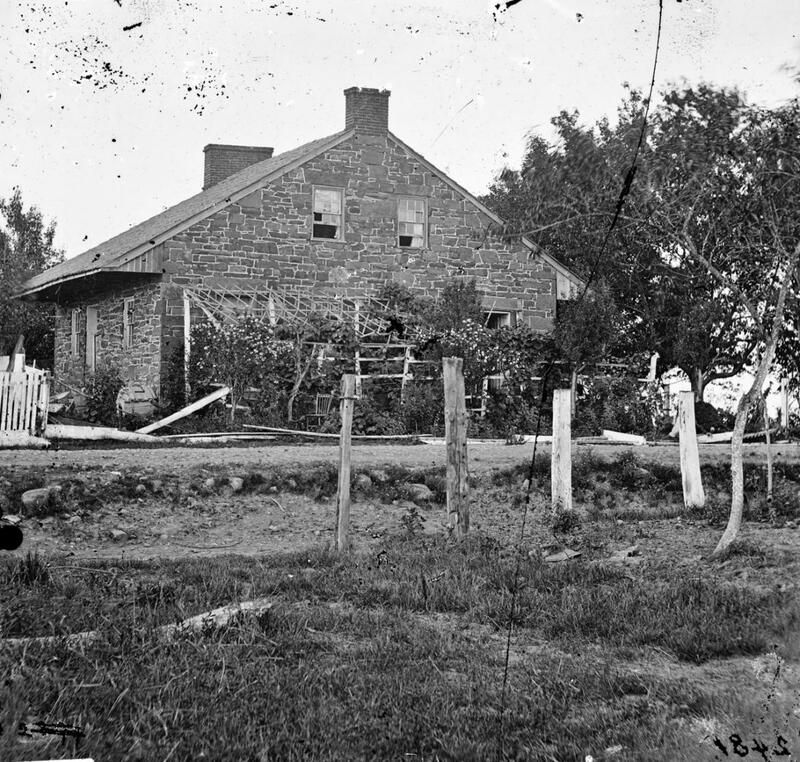 Across the Chambersburg Pike from the Thompson house was the apple orchard. The summer drought has been particularly hard on Gettysburg and Adams County this season, and this orchard was holding up as well as the others we have photographed so far. The building in the center background is owned by the Lutheran Theological Seminary. This view was taken facing southwest at approximately 6:40 AM on Tuesday, July 6, 2010. 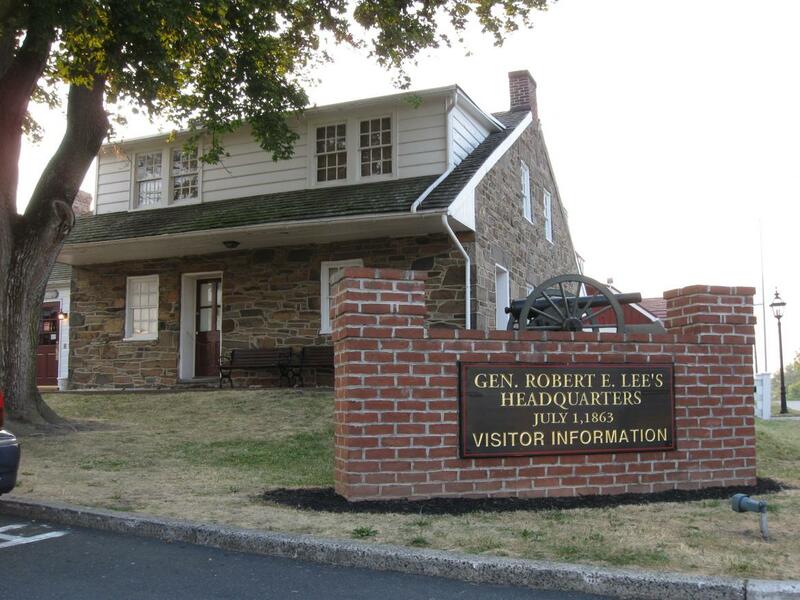 So, where was General Robert E. Lee’s headquarters during the Battle of Gettysburg? Was it here, in this apple orchard? … This view was taken facing southwest at approximately 6:40 AM on Tuesday, July 6, 2010. … Or was it here in the Thompson house? 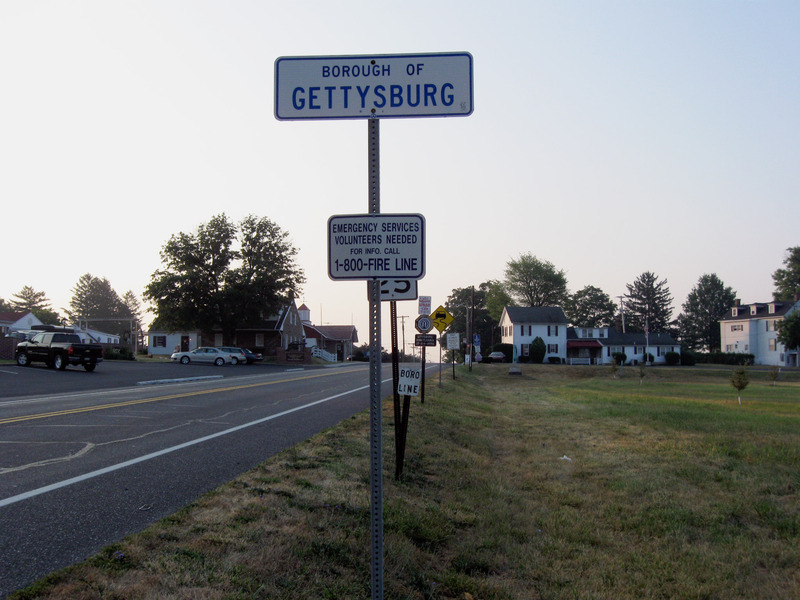 Even though it is commonly referred to as Lee’s headquarters, and even though it was the center of fierce fighting on July 1, 1863, the Thompson property was never purchased by the Gettysburg Battlefield Memorial Association, the War Department, or the National Park Service. Today it is privately owned and operates as the General Lee’s Headquarters Museum and charges admission for non-Adams County residents. It operates in partnership with the adjacent Quality Inn, which rents the second story to visitors as the “General Lee Suite.” This view was taken facing north at approximately 6:40 AM on Tuesday, July 6, 2010. This image, also photographed by Brady and his crew, is a combination of the left and right portions of the original stereograph, which we have stitched together. We encourage our readers to click on the image to enlarge it, and to visit the Library of Congress high-res versions, as the three individuals in the photograph become much clearer upon zooming in. 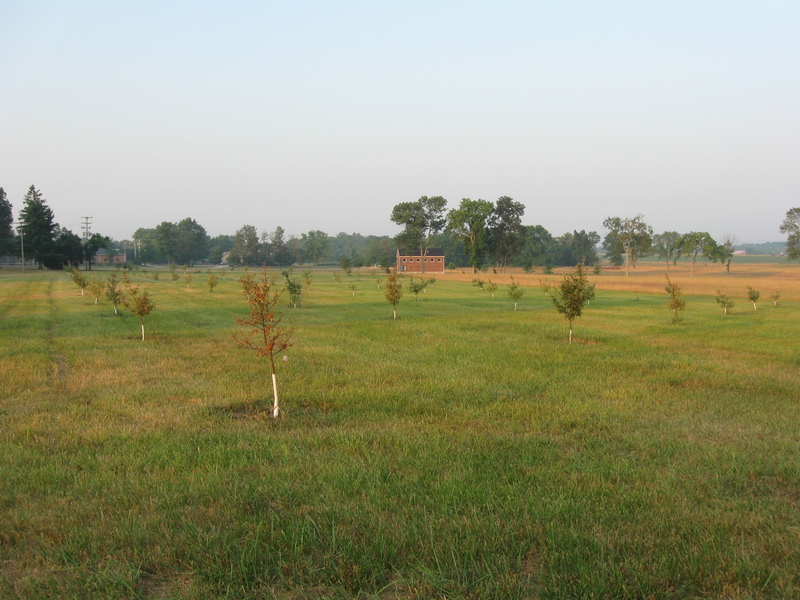 The out of focus tree in the foreground is from the orchard that we are showing you today. This view was taken facing north in July, 1863. 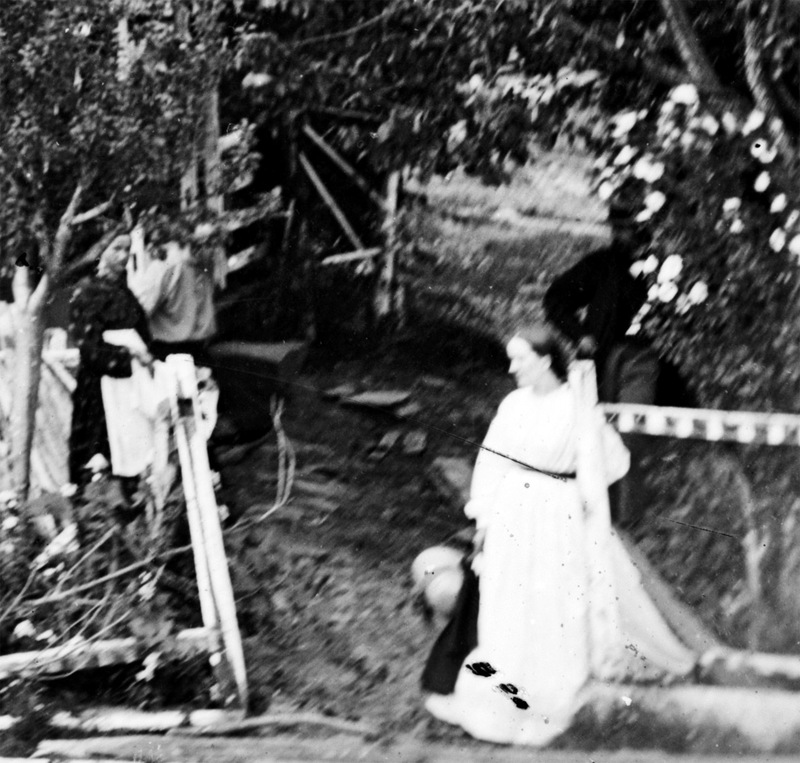 The individual in white in the foreground is likely Mary Thompson herself, aged 69 at the time of the battle. 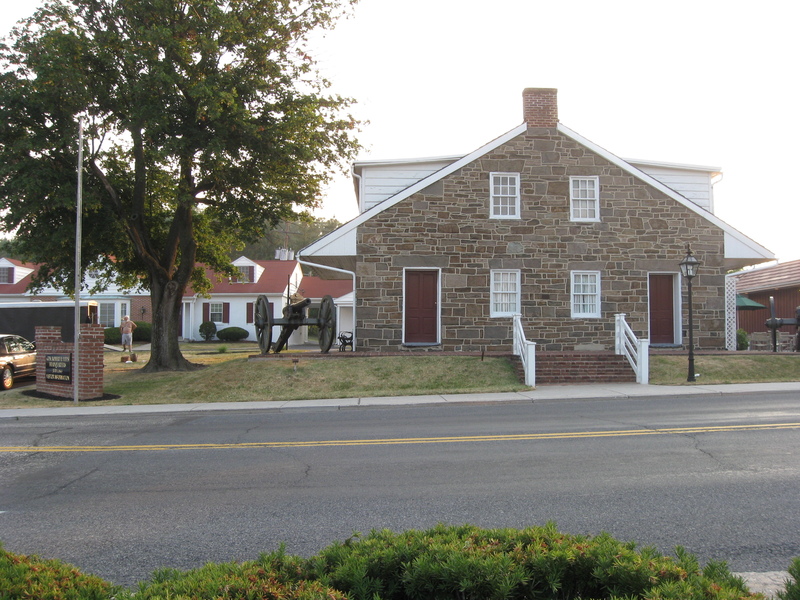 The woman in the left of this cropped section is possibly Mary Thompson’s daughter, Hannah Foulk, who lived down Chambersburg Street and was reported as having spent the battle with her mother. The man standing in the shadow and partially obscured by the tree is photographer Mathew Brady. This view was taken facing north in July, 1863. In the decades after the battle, there was little question that Mary Thompson’s stone house was the headquarters of Robert E. Lee. Visitors flocked to it, postcards were printed of it, and before the Virginia State Monument was dedicated in 1917, it was viewed as the most famous Confederate “monument” on the battlefield. It is no surprise that the current owners use this “headquarters” label as frequently and prominently as possible. This view was taken facing northeast at approximately 6:40 AM on Tuesday, July 6, 2010. Pennsylvania College (Gettysburg College) Professor, Michael Jacobs, interviewed Mary Thompson in the aftermath of the battle. He reported that Mary said General Lee took all his meals in the house, as well as spending the night there. It is accepted by many that the house was a duplex, and that since by 1863 all of Mary’s children had moved out, the second half of the house was empty. This would have likely made it attractive for Lee as a location for his headquarters as it was easy to occupy. But what about the cannon barrel in the left portion of this view, to the left of the telephone pole? We’ll pickup the rest of the story with what that marker has to say in Part 2. This view was taken facing northwest at approximately 6:40 AM on Tuesday, July 6, 2010.